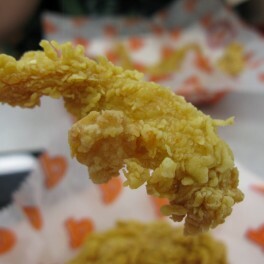 For a limited time, until the end of June 2010 or while supplies last, you can get an order of Popeye’s Wicked Chicken for only $3.99. 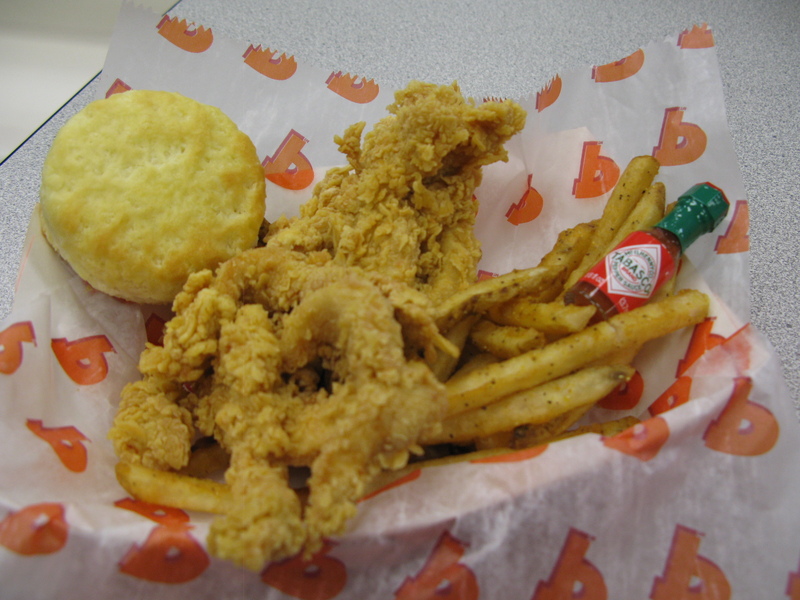 Tender, slender, deliciously breaded strips seasoned especially for Popeyes, comes with one side, a biscuit, and is served with a miniature bottle of Tabasco Sauce – this is good fried chicken and a great deal! Be sure and try the Cane Sweeeet Iced Tea for 99¢ – it is so much better than McDonald’s. 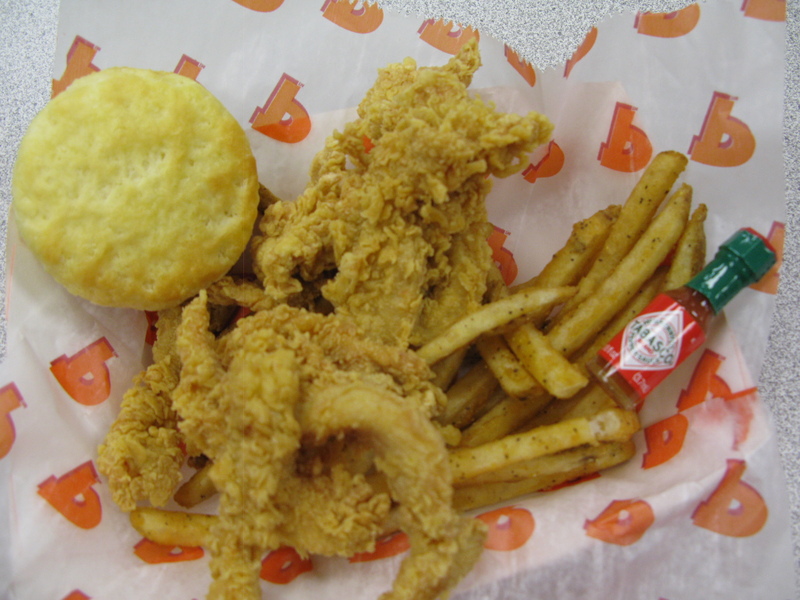 Why am I posting about Popeyes? Because they contacted us, sent us a few gift certificates, and asked if we would try the Wicked Chicken and write about it. So, my friend, while this is indeed a compensated review, everything we say is our honest opinion. Marilyn and I both sat down to try Popeye’s Wicked Chicken. The restaurant did not know we were reviewing. Marilyn dissected one of the strips and discovered the chicken meat is seasoned and marinated before the breading goes on. 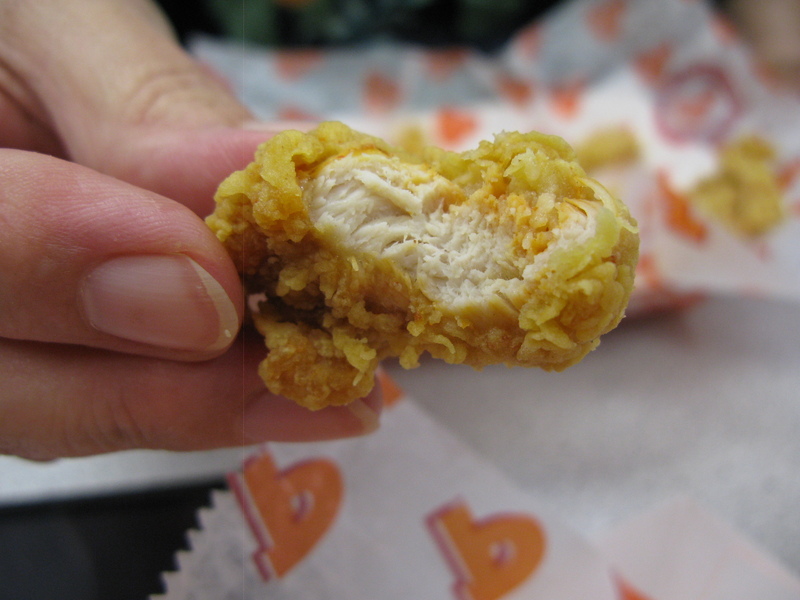 These little strips are much smaller than your standard tenders. It makes them look all the more “Wicked”. But even though the strips were small, the chicken was very moist and tender. 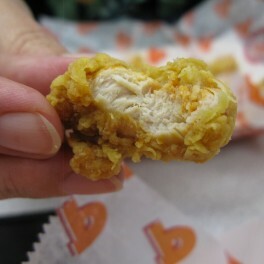 We were both surprised at how tender yet crunchy the breading was. As you can see it the pics, they look very “craggy” and… well, Wicked! But we found out in talking to the manager that COLD is the keyword of the day. The batter and the chicken MUST be at 40° or less, and the flour freshly sifted. When this combo hits that very hot fryer… you get the results you see in these pics. I was disappointed in the heat level of the Wicked Chicken. It was mildly spicy… certainly not wickedly hot. As a matter of fact, we got a regular spicy chicken tender to compare with. 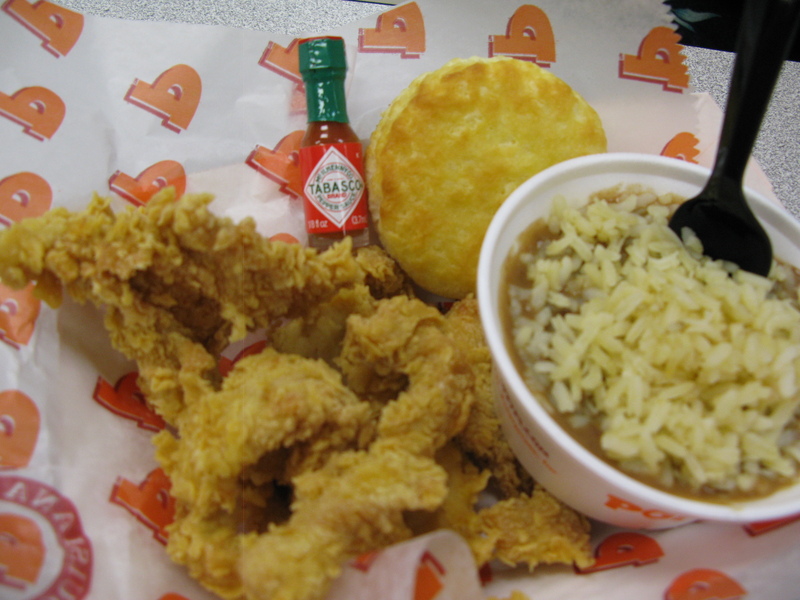 Popeye’s calls it “Bona Fide Spicy”, and that was considerably hotter and spicier. 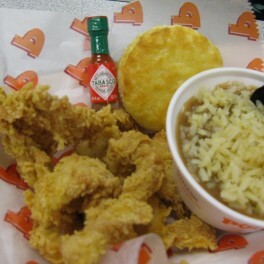 Perhaps that is why they include the miniature bottle of Tabasco sauce with the Wicked Chicken. Note to Popeye’s Management: We dined at Store #4268 and manager Trish Kallenberg and her staff are to be commended for great friendly service, and a remarkably clean dining room. We really did enjoy the meal, and I mentioned the Cane Sweeeet Iced Tea is spot on. Thankfully the Sweeeet Tea will be available all summer, but the Wicked Chicken only lasts through the end of June. 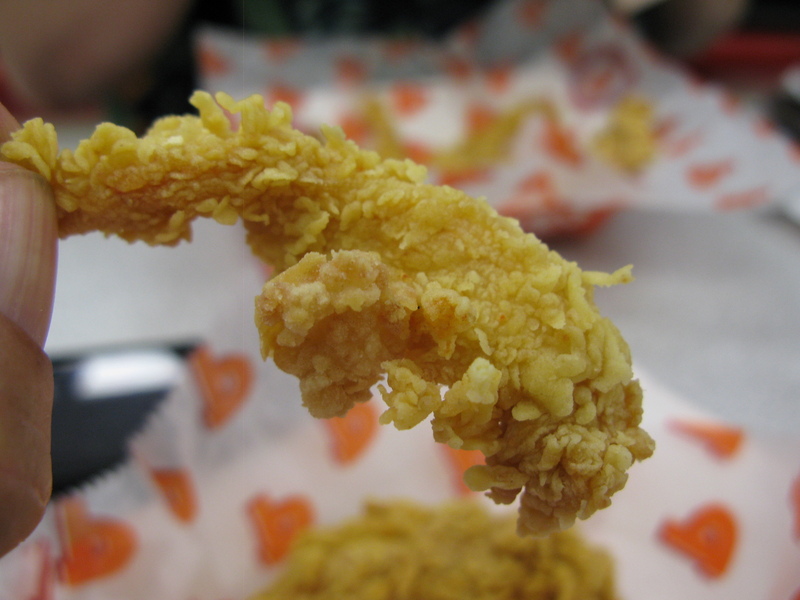 Get yourself to a Popeye’s near you and enjoy this unique dish while it lasts. Yea we know how you feel about the Exalted King of hot sauces, Tabasco. 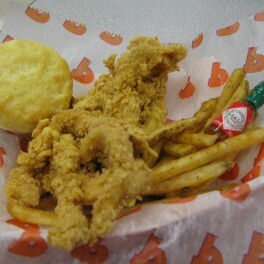 I have so missed Popeyes since moving to Tennessee almost 10 years ago. Thankfully they have just opened one about 5 miles from us. I will have to swing by and try these wicked hot strips. They’ll probably be just right for me, since I’m a “heat wimp” compared to you, Scott, and crew. Glad you liked em, thanks for the wicked-good review…Keep on eatin so we can keep on readin! Why is everything so limited this summer! I had this order once this month and I loved it. Why must Popeyes take away something that we love….I never got any mini tobacco sauce though. That would have been great.